Although some believe honey to be a healthier alternative to common table sugar, both have a similar caloric value per ounce and are composed of easily digested simple sugars. Therefore, both can rapidly elevate your blood glucose level. Honey, however, does contain a number of nutrient compounds in small amounts that are not found in table sugar. Honey carbohydrates consist of simple sugars, including fructose, glucose and sucrose, formed from bee nectar. Table sugar is composed of sucrose, which is the combination of fructose plus glucose. These simple carbohydrates are the sole source of calories found in both honey and sugar. Too many simple carbohydrates from either source may cause weight gain or prevent you from losing weight, according to diet and fitness expert Dr. Melina Jampolis on CNNhealth.com. Eating too many simple carbohydrates in general should be avoided in favor of complex carbohydrates and dietary fiber. Honey consists of about 80 percent simple sugars. Therefore, honey contains about 80 percent of the calories found in an equivalent weight of table sugar, or pure sucrose. However, a tablespoon of honey weighs more than a tablespoon of sugar and contains more calories. One tablespoon of honey contains approximately 60 calories, while a tablespoon of sugar contains about 45. Calories from both sources are considered "empty" calories because they provide little more than energy, although honey does contain small amounts of some nutrients. Choline has been considered an essential nutrient in humans since 1998. Your body needs choline to make cell membranes. Your brain requires a compound made from choline called acetylcholine to transmit signals between brain cells. A review published in the December 2008 issue of the "Journal of the American College of Nutrition" reported that 100 grams of honey may contain up to 2.5 milligrams of choline and 0.5 milligrams of acetylcholine. However, even at this level, you would have to eat over two pounds of honey to obtain around five percent of a daily adequate choline intake. 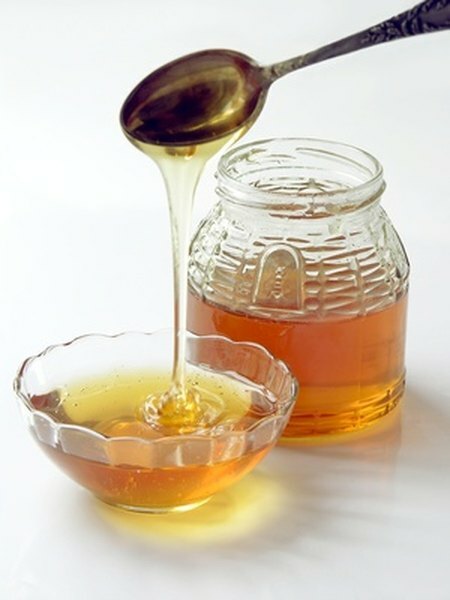 Honey contains at least 181 substances, according to a review published in the April 2010 issue of the "Mediterranean Journal of Nutrition and Metabolism." Compounds found in honey and not in table sugar include small amounts of proteins, amino acids, vitamins and minerals, as well as aroma compounds and polyphenols. Although recommended daily intake values have not been established for some trace elements, honey may contain low levels of sulphur, boron, cobalt, fluoride, iodide, molybdenum and silicon. Different varieties of honey may contain varying amounts of these nutrients. Academy of Nutrition and Dietetics: Is Honey More Nutritious than White Sugar? CNNhealth.com: Is Honey a Healthier Alternative to Sugar?